Last week, on WED evening, I had dinner with Marc Dworkin – he was in Romania for a few days to check the vines and the grapes at Aliman, and taste the 2010s that are still in barrel. 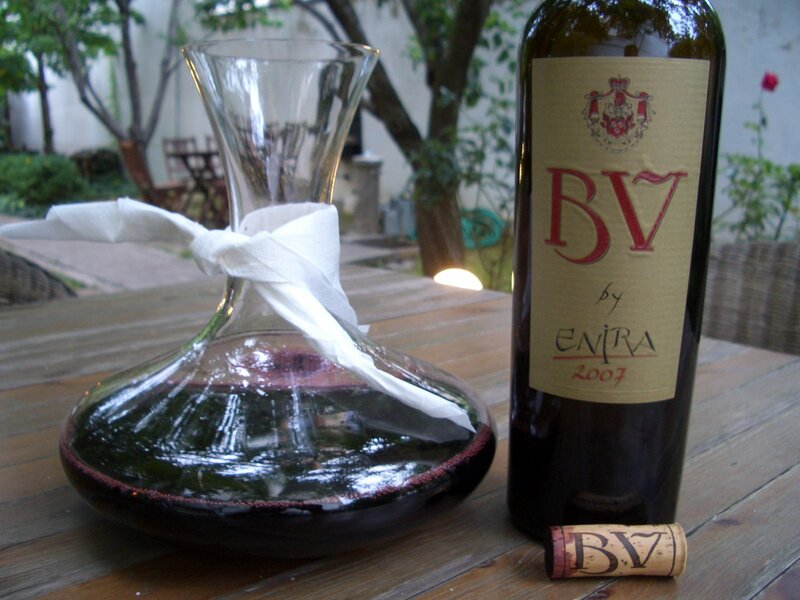 I asked him if we could taste 2007 BV by Enira, as my last attempt to taste this wine together with Mr Karl Heinz Hauptmann was not successful – out of all the wines tasted, this one was corked. Marc kindly agreed. 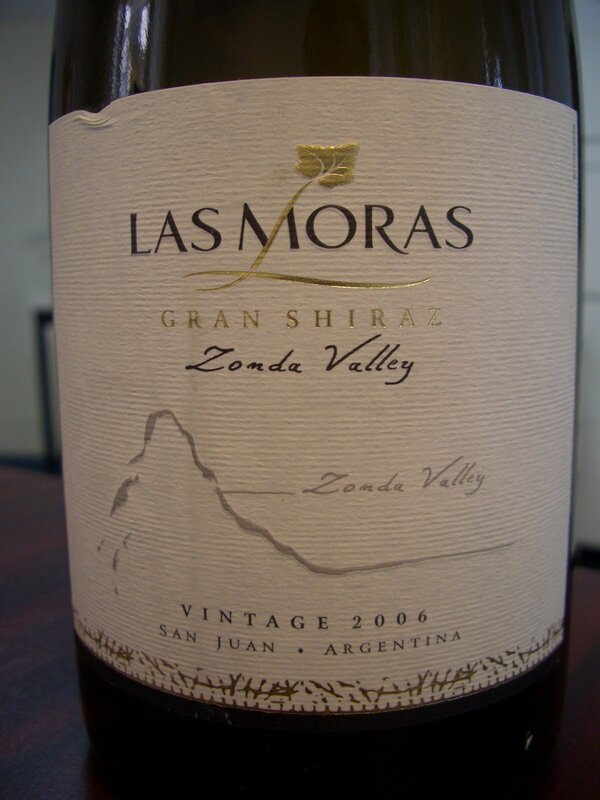 We started with an Argentinian Shiraz that was offered to me by its producer at Vinexpo. After about 45 min in the decanter we poured the BV. 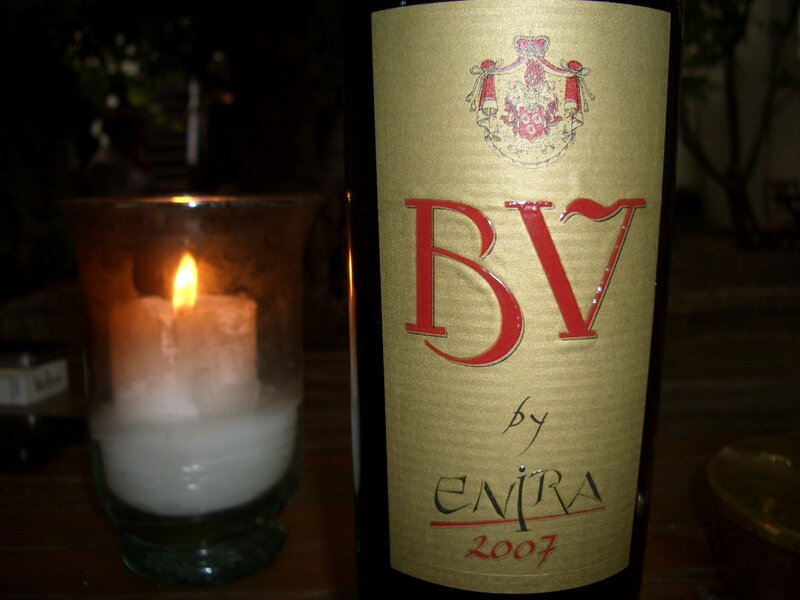 BV is Enira’s garage wine. A blend of equal parts of Cabernet Sauvignon, Merlot, Shiraz and Petit Verdot, aged for 18 months in new French oak. They usually use the best parcels of grapes to produce this wine in limited quantities. According to Marc, BV 2008 is better than the 2007. Will have to see it when the wine will be released. It is always nice to taste the wine together with its maker. On SAT we repeated the great food experience my wife and I had last MON together with our Greek friends and the unbelievable tasty food Christiana makes. This time she invited us for a delicious slow cooked lamb brought from Crete. The lamb was cooked for almost 5-6 hours at a very low fire in the oven together with some Cypriot Halloumi cheese and potatoes. 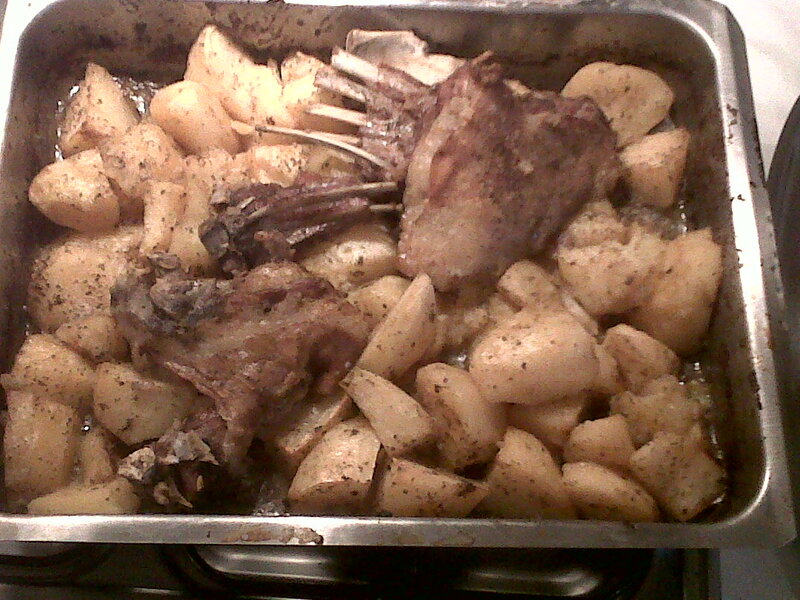 The potatoes were roasted in the oven using lamb fat therefore the final result was very delicious. As our hosts prepared such a gargantuan meal it was only fair for me to bring at least the wines, so my choices for SAT were three different wines: a white for appetizers and two reds. 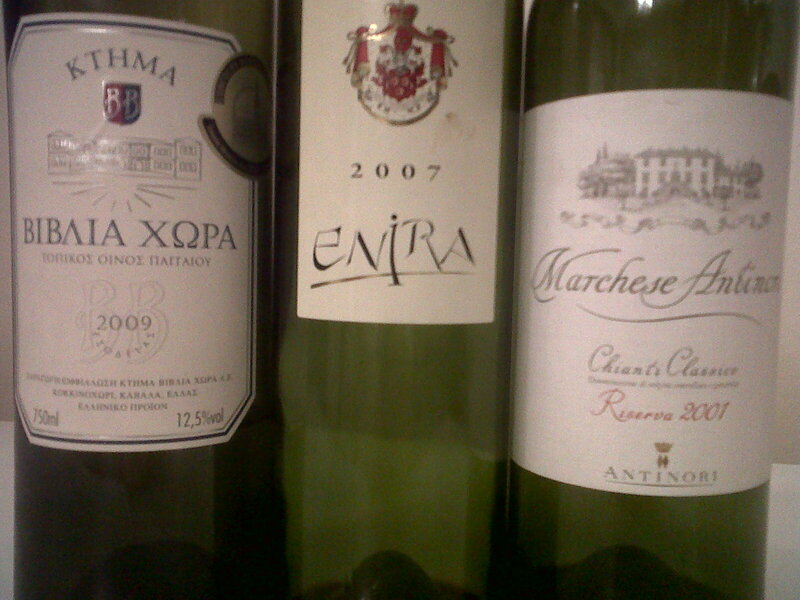 The reds were Enira 2007 and 2001 Antinori Chianti Classico Riserva Tenute Marchese. The white was a bottle purchased from our 2010 vacation in Greece: Biblia Chora 2009 a wine commented already several times on this blog. As the ladies still had some immediate massage to attend before lunch, me and Iannis, our host, opened the Enira 2007 with some cold mezze – a term used in Greece for small portions of different food that can be from cold and hot appetizers to the actual final dish of the meal. The rule is to keep the small dishes coming. This can go on for hours. So we started the meal by sampling different cold appetizers and drinking Enira 2007. After about 1 hour our ladies joined us at the table and we started with a hot salty cheese pie. To match this salty hot cheese pie we opened the white Biblia Chora 2009, a wine I know my friend Iannis likes a lot. The wine delivers great freshness and a pleasant modest complexity. For the main attraction of the lunch – the slowly cooked lamb from Crete – we opened the 10 years old Chianti Classico Riserva from Antinori and left it in the decanter for about 45-60 minutes. This is the second bottle I have this week from the lot of wines purchased recently and this bottle shows itself better. The first bottle I had on TUE was in a more developed stage of maturity. I guess it is fair to say we have a case of serious bottle variation. Today I have the proper tools to uncork the wines so the process goes smoothly. The cork is almost completely soaked in wine. This is something that troubles me as most of the wines I had from Italian producers, especially Antinori, have this in common. I am not talking about 2-3 isolated cases here. I remember when I opened the 2000 Solaia that its cork looked the same: completely soaked in wine. These are wines that have no problem resisting the test of time, but the cork can make a serious sabotage and spoil everything. The wine is a perfect match for the two ways lamb. 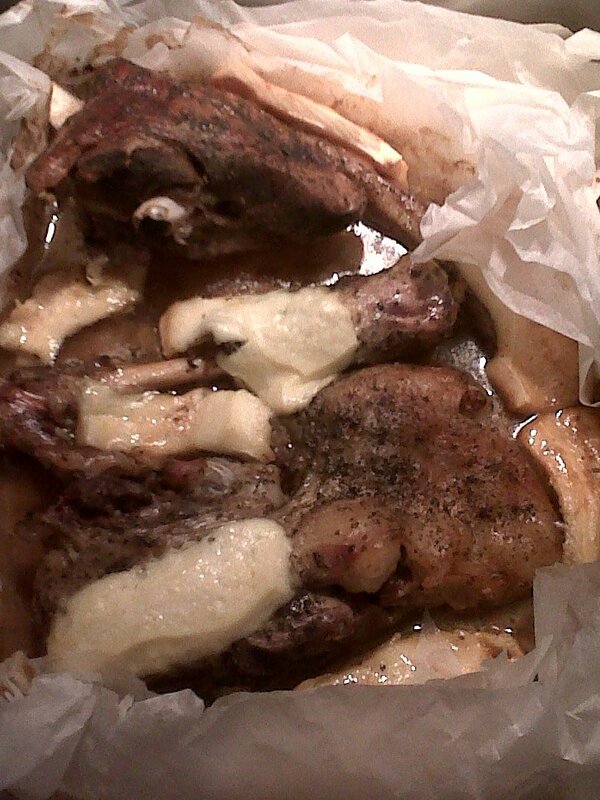 The Halloumi cheese melted and covered big parts of the lamb with a crusty layer. For me and Iannis the combination between the 10 years old wine, the tender and juicy lamb and the crusty Halloumi cheese is perfect. All the people at the table appreciate both the food and the wine, but the ladies prefer more the younger Enira because of its sweet fresh ripe dark fruits. 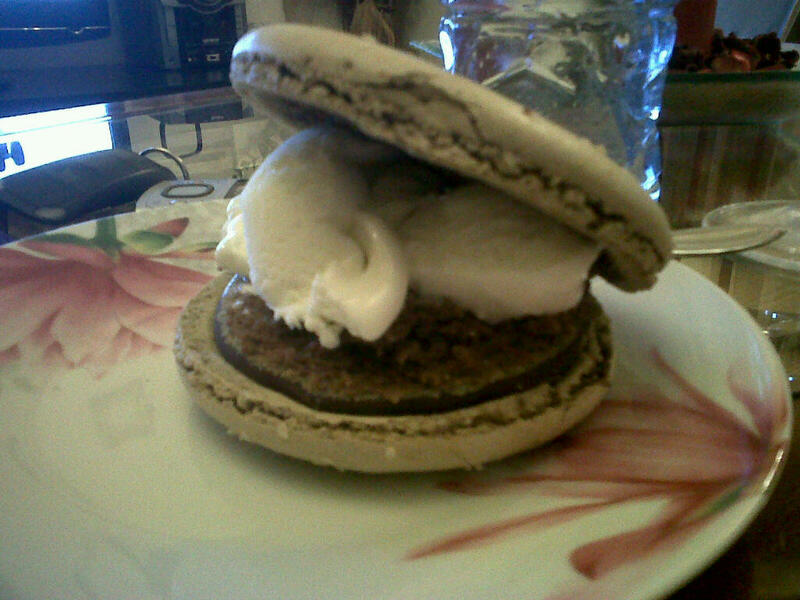 We finished the meal with an interesting dessert: a cheeseburger made with marsh mellow and ice cream. A little bit too sweet for my taste but good nevertheless. This was the culmination of an amazing lunch spent in good company with great food and wines. I hope your weekend was as good as mine. P.S. The pictures on this post have a lower quality as I forgot my camera at home and I had to use the Blackberry to take photos. I received an invitation from Mr Ghenadie Bobeica, the person in charge of Winero – the producer of Alira and importer of Enira wines in Romania, to taste together their whole range of wines that are currently available on the market. The tasting was hosted at the Escargot in the company of one of the shareholders of Enira/Alira – Dr Karl Heinz Hauptmann. Together we had the chance to sample about 8 wines. This was a good opportunity to find out more about their Romanian project at Aliman. Dr Karl H. Hauptmann is the main shareholder of Bessa Valley Winery, the producer of Enira wines, and has also vineyards in China, Germany(Mosel – 1 ha and looking to purchase more), Switzerland and now in Romania. He was Managing Director of Merrill Lynch in London and Vice-President of the London Bankers Trust International. He confessed discovering his passion for wine in 1987 while having a lunch in London when he tried different old vintages of Bordeaux – from 1975 down to 1929. He started to actively collect wine only 11-12 years later and buying his first vineyards in 2000-2001. Now his wines collection contains over 11.000 bottles of Bordeaux and insignificant quantities from other areas. He started to purchase en-primeur Bordeaux in 1999-2000 and continued doing so ever since. There are exciting things to be expected from the Romanian project at Aliman. Dr Hauptmann compares Feteasca Neagra to Blaufränkisch grape from Austria, capable of producing a low alcoholic but aromatic wine, more Burgundian style than what it is available today on the Romanian market. This is a totally different perspective than what Recas has in mind with their joint venture with Masi to use Feteasca Neagra for an Amarone style wine. So the next years will be very interesting for Feteasca Neagra. There are also plans to start planting white Romanian grape varieties in limited amounts initially at Aliman – 2 ha for each variety – just to experiment with the terroir and see what gives the best results. 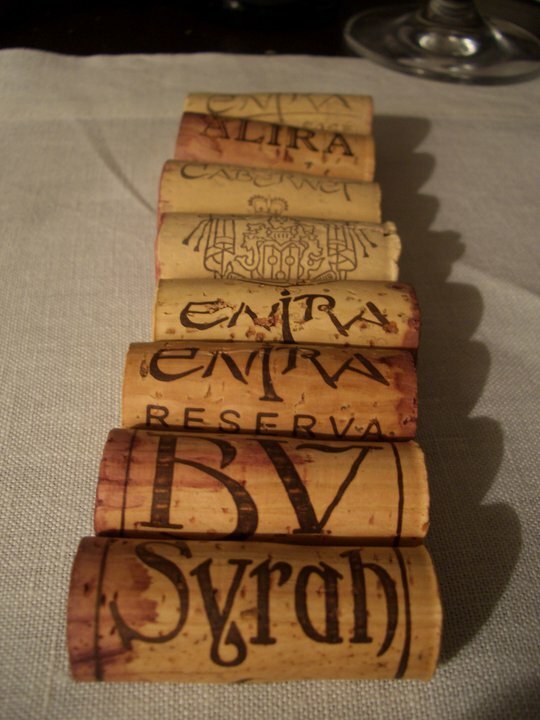 Last night we tasted 8 wines: 2009 Enira Rose (blend of Syrah and Petit Verdot), 2008 Easy by Enira, 2009 Alira Merlot, 2008 Cabernet by Enira, 2006 Enira, 2006 Enira Reserva, 2007 BV and 2007 Syrah. Unfortunately the BV was corked so we couldn’t drink it. I did not drink BV and Syrah previously therefore it was a great chance for me to taste the wines(at least the Syrah). The wines I liked the most from the bunch were the 2008 Cabernet by Enira and the 2007 Syrah. The Cabernet has evolved nicely since the last time in spring when I last drank it.Even though it is not a too complex wine, the purity of the fruit, the nice mouth feel and the beautiful balance are really making this a very good pairing for barbecues or any other unpretentious food. The 2007 Syrah by Enira is a hedonistic wine with a tremendous balance without being over the top. The nose shows plenty of ripe dark fruits mixed with spices and floral aromas(lilies and violets are really nice). In the mouth the wine is full body with silky texture and beautiful concentration, really balanced. The strong point of this wine is its long finish. The wine coats the palate with concentrated sweet fruit and spices, the aftertaste lasting more than 10-15 seconds. It is a wine that goes very well on its own and it is reminding more of an Amarone than of a Rhone Syrah. Excellent+ wine. People that like Bordeaux might not prefer this style. The food was good as usual at Escargot. 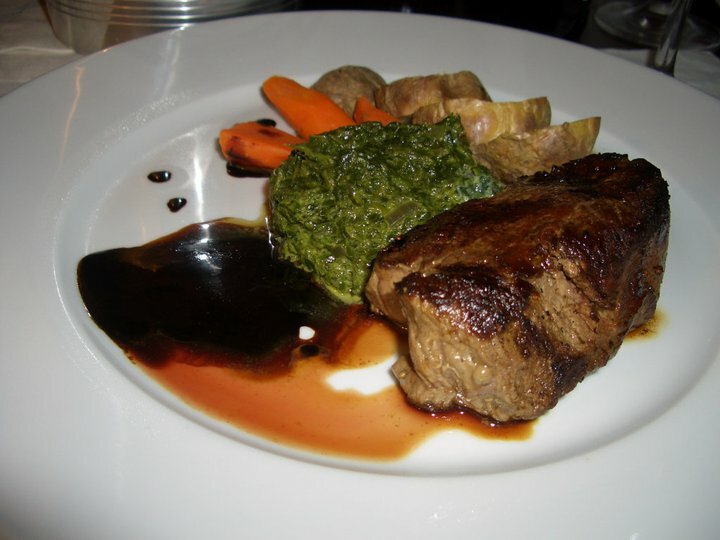 I had a tasty beef steak with a mix of vegetables that paired well with the last three wines, the high end range. Initially Dr Hauptmann intended to purchase vineyards in 2000 in Romania, but due to complicated procedures and easier access to land in Bulgaria they decided to start in Bulgaria. According to him, both countries have the same great potential for wine making and the only advantage Enira has over Alira is the 5-7 years advance that gave the vines time to accommodate better. It is expected for the vines in both sites to hit their real potential once they are 20 years old. Great night with interesting wines and good company.